Welcome to our Sixth StreetWise Challenge Showcase ‘Reflection in the Street.’ We are thrilled to share it with you. Thank you so much for participating and sharing your beautiful photographs. Lee and I were quite wowed by all the incredible submissions to this challenge. There were so many varying, artistic ways in which reflection was captured that it was difficult for us to chose amongst them. It’s also nice to see our wonderful, creative group continue to grow. A reminder that the deadline for the October Showcase is October 15th. Please post your photographs to the Flickr site to be considered for the showcase. Cara’s image beautifully captures a bustling city scene, alive with people. At once, the viewer is afforded the impression of being at the center of a midday rush. What is mesmerizing, is the abundance of reflections in the many mirrors – stark and modern, reflecting classical, traditional architecture and a cloud-dotted blue sky, lending this street photograph a magical, wonderland feel. In the foreground’s large triangle of sunlight, front and center, are two people crossing paths each immersed in daily business. 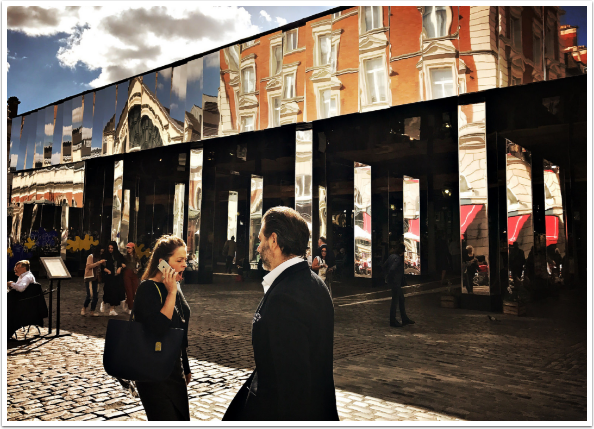 In the background, people are milling about, some seated enjoying a beautiful day, others seem to be taking things at an even slower pace – admiring a marvellous changing surface reflecting a colourful array of architectural details, while yet others are a mere reflection. This photograph is chock full of details – from neatly divided sections created by light and shadow, to the facade of mirrors, to the deep blue sky above it. There’s also textured cobbled stones, ever changing intensity of colours, perspective and viewpoints all of which encourages the viewer to get lost in a dream. What a well seen, magical photograph. Brava Cara! I love how Manuela’s photograph only hints at there being people via the reflection of architecture in the window and the elegant dresses on hangers. The azure blue light reflected in the building’s windows and the golden light back-lighting the scene add an ethereal quality. There isn’t a need for subjects here — instead we are immersed in an altered reality of dreams and dresses. This reflection image is utterly delightful, well done, Manuela! 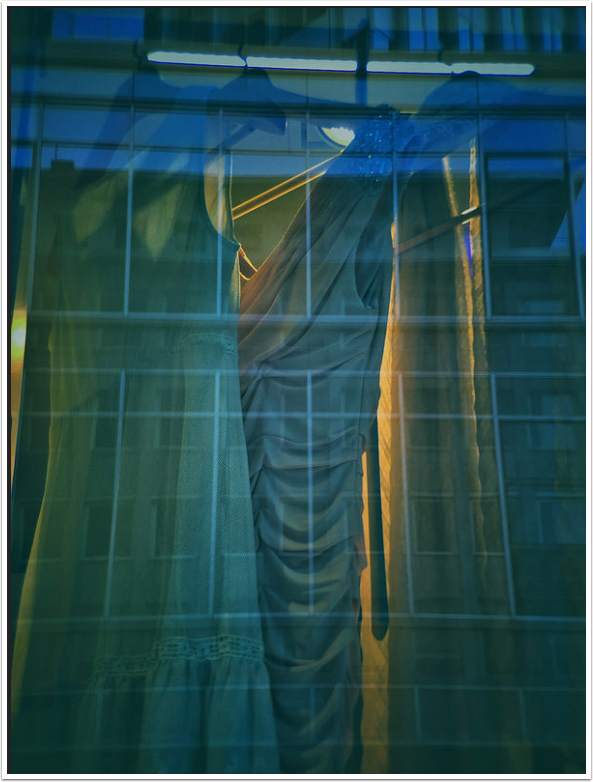 Magda has captured a wonderful mannequin reflection that harkens to another era reminiscent of a vintage art deco poster, that somehow seems futuristic at the same time with the reflection of the building’s vent looking like a robotic arm band / cuff on the mannequin’s arm. The mannequin is beautifully framed against the bold shape of the institutional looking building. As the mannequin is wearing what seems to be a ‘nurse meets gothic’ uniform with the little cross and nursing cap, the viewer is given leave to imagine the building is perhaps a hospital – adding to the dark moodiness. Magda’s edit including the grainy texture adds to the vintage ambience. 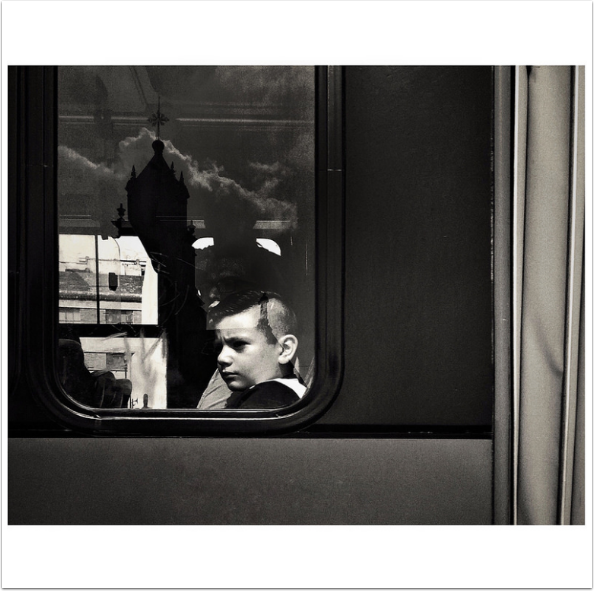 Vondav’s exquisite candid portrait depicts a young traveler in the window of what looks like a public transport – a bus or train. The traveler is wonderfully framed with the multi layers of shades of grey of the bus / train and the dark shadows behind him, and his face is beautifully highlighted with the natural light coming through the window. The reflection on the window is magnificent showing the silhouette of a cathedral’s steeple while the white edged clouds give the scene a cinematic feeling tone. The graffiti scratched into the window adds to the photo’s sense of time and place. Behind the child, there is another vague silhouette of an obscure passenger – adding to the mystery and mood of the photo – where is this, and where is the journey taking the young traveler?